Today please welcome, from the famous Team Damyanti, Samantha Geary Jones! She has some news about her latest project. She's one busy lady, so it's a real privilege to have her guest today! Where epic music, captivating tales and visionary art inspire the HERO in all of us! FREE ebook Launching June 2nd! Welcome to Heroes of Phenomena, with my favorite composer gang over in Hollywood and leaders of the film music advertising industry, audiomachine! As part of a global, cross-industry promotional project for audiomachine’s upcoming public release, PHENOMENA—by celebrated composer, Paul Dinletir—we’re introducing a groundbreaking campaign to encourage the next generation of authors, artists & musicians! With each download of the upcoming FREE PHENOMENA companion ebook, audiomachine will make a donation to the LA Youth Orchestra. The ebook will also feature a dedicated YOUTH section, showcasing the talents of aspiring artists and authors from the gifted students of Elevate’s Life & Art Studios! Winning authors & artists of PHENOMENA’s EPIC HEROES CONTEST will be joining our innovative & inspiring event, alongside these amazing industry professionals: Authors Susan Kaye Quinn, M. Pax, Amy Willoughby-Burle, Jessica Bell, Alex J. Cavanaugh, Ruth Long, Darynda Jones, Crystal Collier, Samantha Redstreake Geary & C.Lee McKenzie! 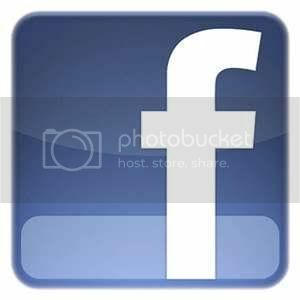 Samantha blogs at Writerly Sam, and can be found at facebook, and Twitter. Today we have the amazing privilege of having one of the most infamous A-Z affiliated bloggers (and I say affiliated since he has never really, though that's up for debate... participated in any of the A-Z Challenges) graciously allowing us to use his satirical Reflection Pawst. To really understand how special this is, you need to know that Gary does the Challenge in his own way. One year it was backwards through the alphabet, this year he had his Alphabark Challenge, run by Penny, the Jack Russell dog and modest internet superstar. Despite his "disdain" for a month long Challenge which "hogs the blogosphere" he probably does more to promote our endeavors than most. We love our Gary and his trusty sidekick, and graciously thank him for all he does behind the scenes for us. Take it away Gary and Penny! The Alphabark Challenge, 2014! 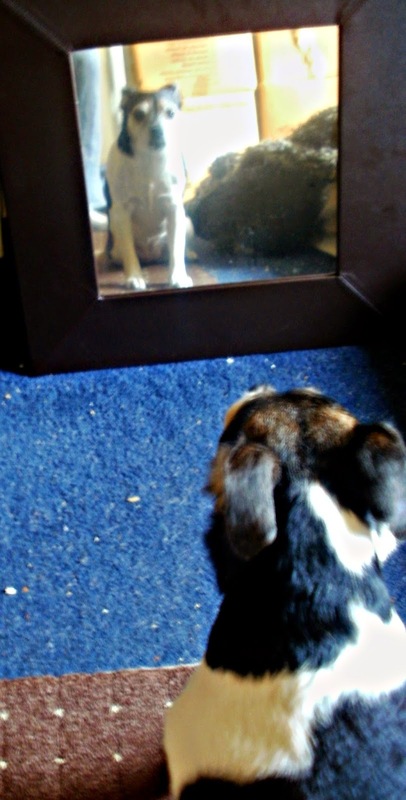 Reflection Pawst. 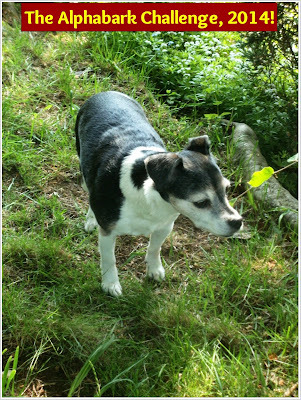 "J" is for "Jack Russell"
"Y" is for "Y am I doing this?" Am I taking the p**s? Gary blogs at Klahanie, where his goal is to take away the stigma of mental illness and to spread kindness, love and peace to all who visit. Please go say hi. You'll make a great new friend! So, welcome to our second leg of the Post A-to-Z Road Trip! No trip would be any fun at all without visiting Alex J. Cavanaugh! Ninja Captain. Rock Guitar enthusiast. Science Fiction Adventure Author extraordinaire. Blog Genius. Music and movie connoisseur. IWSG creator. If you're not visiting his blog regularly, you are missing out. Stormy and I LOVE Tara and we always have a great time visiting her blog. She is a mom, a teacher, an author, and a lazy housewife (her words, not mine). She has a new book coming out soon and I'm so proud of her and excited to see what she comes up with next. Christine's 13th Floor Series is one of my very favorites and I'm looking forward to what she's got up her sleeve. She always adds a twist to a tale you think you know and proves you, oh so, wrong. One day, DL put up a few paragraphs of his writing for all of us to read on his blog. I can still remember my heart pounding while I read it and the premise still haunts me today. I really want to finish reading that story and I hope that we all get the chance to do just that. Have you heard about Write Club? Well, DL is the founder of the Club and he really wants you to go visit his blog and check it out, maybe even sign up! There's only a few days left. Did you know that writing responses on your blog is of the quickest ways to feature a blogger in one of your posts? There are many ways to use the topic of another blogger’s writings as a springboard for your own blog’s content. Consider posting content that elaborates on a comment that you left, if any, on his or her original post. You can also forego commenting altogether, and write a response on your blog, making sure to link the post that sparked this subject you’re covering. No matter how you approach this method of responding to blogs you visit, it’s a win-win situation for all parties involved because it comes in handy where marketing and content creation is concerned. Writing in response to the blogs you visit helps to cure writer’s block. Reading someone else’s perspective on a topic, or learning about certain experiences he or she had, is likely all it takes to revive your creative juices when you find yourself coming up short of blogging ideas. 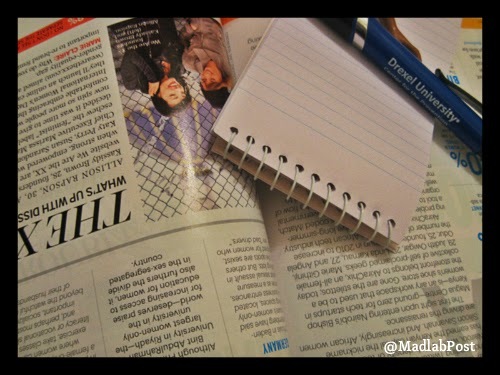 Writing in response to the blogs you visit fosters interaction between bloggers. There is a good chance that bloggers whose post you’re responding to will visit your blog if you leave a comment on what they originally wrote with the permalink to your reaction. This might even lead to a mention and link in their latest blog post, which is one of the easiest ways for you to gain new readers. In the same breadth, linking to their post in the body of the content you write also helps to send your visitors their way – helping both blogs to build a network within the blogging community. Have YOU ever written a comment that ended up being as long as the average blog post? Nicole Ayers hosts the 'Monday Movie Meme' while also writing about independent film directors and their work at The Madlab Post. When she’s not keeping up with Jack Bauer, she also tweets. Please welcome book reviewer, Lanise Brown! Your theme was libraries around the world. What made you choose that for the Challenge? My idea for the challenge sort of came last minute. 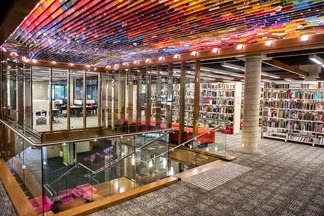 While I was thinking up a theme and searching for cool bookish things online, I came across an article about the amazing libraries of the world. And I had my theme. It’s difficult to pick just one, but I think the Rijksmuseum Research Library in Amsterdam and the José Vasconcelos Library in Mexico top my list. They were all very unique – which one was the most unique or even odd? 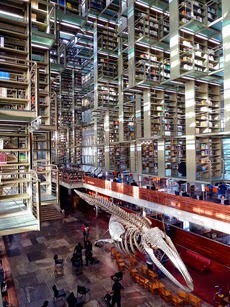 The most unique and unusual was Mexico’s José Vasconcelos Library because of the building’s size, the painted whale skeleton that’s on display in the main hall, and the fact that the library’s been nicknamed the Megabiblioteca (megalibrary). All of the letters towards the end of the alphabet were challenging, but the letter X was the toughest by far. No states or countries in the world begin with the letter X, so I had to resort to cities. 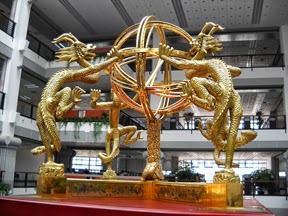 Eventually, I found the Zhangzhou Campus University Library in Xiamen, China. There weren’t many pictures of the library though. Have you ever visited any of the libraries you featured? Sadly, no. But I hope I’ll get to visit a few of the locations some day. Which one is the oldest? 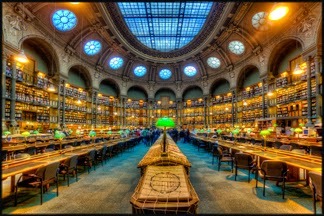 The oldest is the National Library of France, which was founded in the 14th century. I featured the library’s Richelieu Reading Room that houses the library’s rare and antique collections. If someone let you loose in one of those libraries, what would you do and how long would you stay? Oh my goodness. I’d be like a kid in a candy shop. I’d probably grab more books than I could possibly read, and take a lot of pictures of the architecture. I’d make it a daylong event of course. I’ve been thinking about next year’s challenge. I suppose I’ll go with the rarest books from around the world, or I might even continue the library theme. There are so many more libraries to share. Today please welcome Maria Dunn, one of the A-Z Challenge participants. I've been reading reflections, and will be choosing some special ones to feature here at the A-Z. Here's the first in the series. As I reflect on this year’s A to Z challenge, I find a smile come to my face, satisfied to have completed another and already planning for next April. Why smile? Well it feels good to accomplish something that is, well, a challenge. It is always fun to reacquaint with friends from the previous year’s challenge, meet new friends and cultures, and discover talented bloggers to follow. It’s also a real delight to find how I grow through the challenge. I appreciate alternative views a little more. I find myself more compassionate towards the hurting. I understand blogging, writing, and thinking a bit better. 1. Loved catching up with some blog friends I made in last year’s challenge. 2. Loved meeting new friends. 3. Loved visiting with people from diverse cultures and from around the world. 4. Loved being challenged to write. 5. Loved being challenged to think and grow. 6. Glad to be back blogging again after such a long hiatus. 7. Sad so many didn’t finish. 8. Glad I learned so much from some great bloggers like Silvia at Silvia Writes, who wrote on all things Romanian and Sharon at Shells, Tales, and Sails who taught us about all things fruit. Did you know there was an ice cream fruit? 9. Sad I wasn’t able to visit 5 new A to Zers every day. 10. Glad for those I did visit and revisit. I hope to continue to check out others on the list in the coming days and months. Things I learned that were helpful. 1. It was valuable to check in with the challenge website as often as I could to see the daily post there. Often there were helpful tips to enhance the challenge experience. Also, those who are commenting on the challenge website are among those who are surely continuing and so they make good first visits. 2. It was nice not to have a particular theme, but I find that I enjoy visiting those who did, so I am thinking about that for next year. 3. I like being able to find out more about the bloggers themselves. So I appreciate reading the about me link and seeing their photo. I may have to do a better job of that myself. 4. I really liked when someone recommended another blogger, and I usually went over to visit them as well. So I did do that a few times. If I plan it out better, I'd like to include more recommendations or bloggers I found worth a visit. There are plenty I could and would recommend. 5. Last year I planned it out a bit more. That was helpful especially when time got tight. However, I feel less stress about it at this year’s conclusion. Is that because it wasn’t all new or because of just getting to it when and if I could? I don’t know, but I think, if possible, I’ll plan ahead a bit next year. Thank you to all who stopped by. Thank you to the all the A to Z team for your dedication in seeing this through and encouraging all of us. I don't know how you do it, but I know it wouldn't happen if not for you. I appreciate you. And thank you again, Lee, for your brainchild. Really enjoyed visiting with each one of you. Thanks for being here, Maria and sharing your thoughts with us. Maria blogs at Delight Directed Living. Please pay her a visit. The daily specials provided at this rest stop for the 2014 A-to-Z Road Trip are aimed at helping you navigate this alphabet highway most efficiently; to keep your tires, engine and gas tank in tip top shape. Any of the new blogs we visit can be likened to roadside attractions, complete with fishing lakes, hiking trails, historic parks, ancient monuments, carnival rides, festive games and little souvenir shops offering novelties that visitors can share with their friends. So while each road tripper has his or her own map on navigating the A-Z route, which stretches for miles, here are a few additional ways that you can prevent getting lost in deserted towns where “keep out” signs, “out of order” pay phone machines and an undefined substance dominate the atmosphere. Random Reflections - Try to visit all (or most) of the blogs located on the 2014 A-to-Z Challenge Reflections list during your road trip escapades, if you haven’t done so already. Since many of the people who wrote reflections for the challenge, these bloggers are also likely to still be active, displaying new blog posts for you to read and comment on. 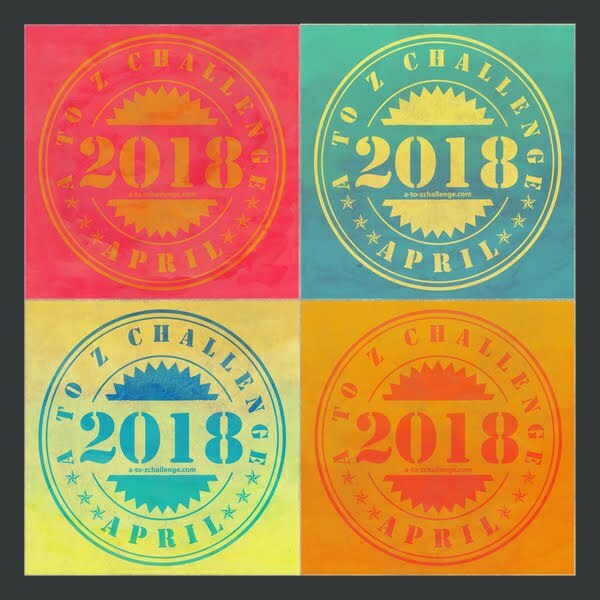 Social Strategy - Skip the 2014 A-to-Z Challenge Sign-Up List for a day and instead, visit participating #atozchallenge blogs that have been active on Twitter. As previously mentioned in a Co-Host Reflections post, this is one way to almost ensure that the blogs you come across will have completed the challenge and are continually blogging about fun and interesting topics, on a regular basis. 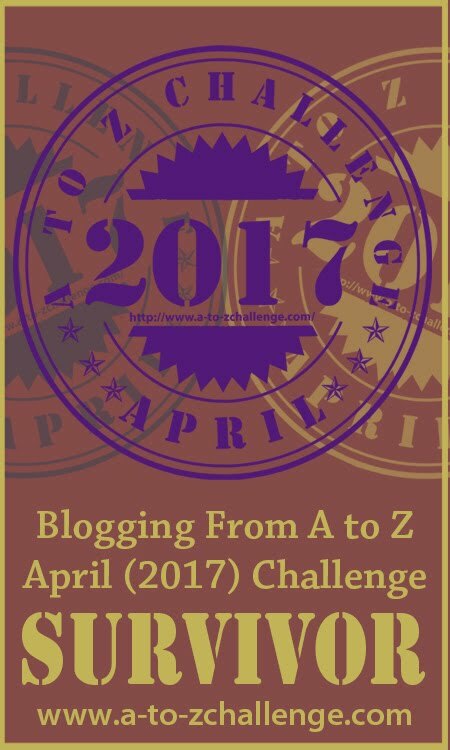 Many of the tweets posted by bloggers during the challenge contain links to A-Z blog posts they wrote for specific letters of the alphabet, which could be a great way for you to make-up for blog posts that you missed in April. 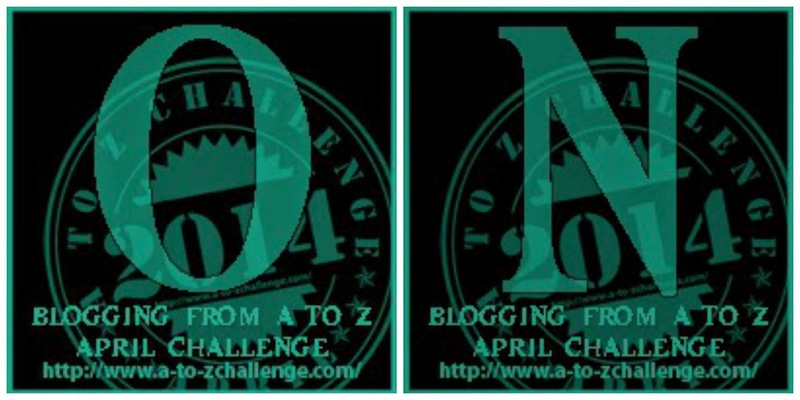 Either way, you can visit these blogs by following the link trail and or discussions within A-to-Z Challenge tweets. 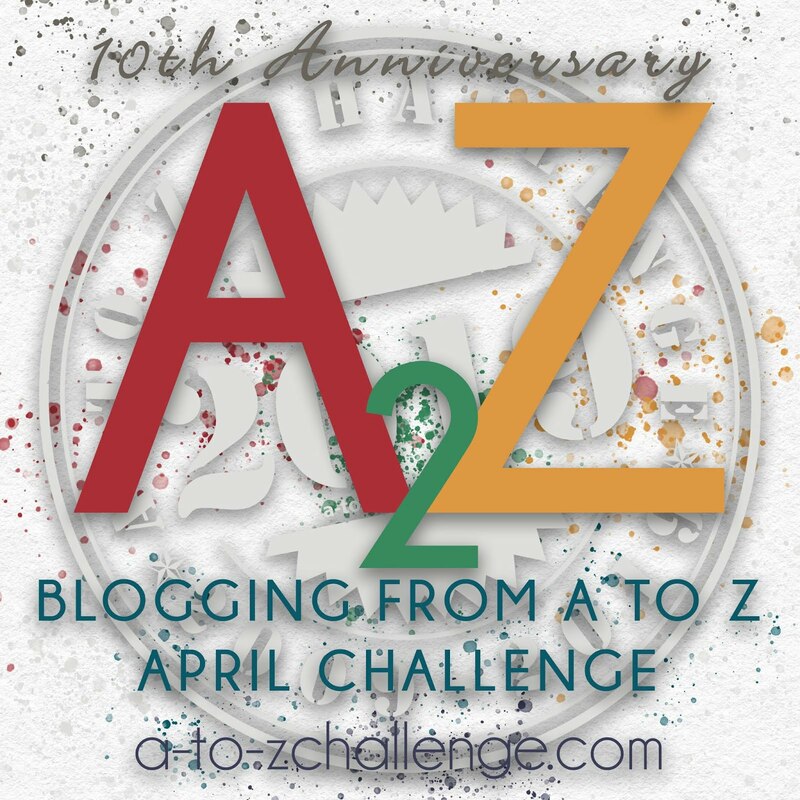 One of the easiest ways to do this is by searching the hashtags #atozchallenge as well as #AZchat and, if you’re venturing out into the off-beaten path… #atozroadtrip. How Many Blogs have YOU visited as of this 3rd Week in May, during the 2014 A-to-Z Road Trip? Have an awesome Memorial Day weekend, everyone! Nicole Ayers makes movies while also writing about independent film directors and their work at The Madlab Post. She is currently celebrating high school proms and graduations of family and friends; thus, may be offline throughout the greater part of the Memorial Day holiday weekend, but wish you all well. It is the 3rd Wednesday of the month already, and as promised, the Storytelling Series continues. With Tricksters! Tricksters are all the rage these days. They are unkillable, unforgettable, and we can't help but love them. From an author's point of view, they are extremely hard to write, and even harder to write well. But when they are done the way they should be, they. Rock. The. World. I have recently posted on my blog StorySpotting about Tricksters done right in contemporary movies and TV shows - you can find the list here. Today, for inspiration, I'll introduce you to some of the stars in traditional Tricksterdom. They are the storyteller's best friend; there is no audience, however old, young, tired, unwilling, or hopped up on candy, that does not love a good Trickster tale. They saved my bacon countless times, on and off the stage. The Spider. Originally from West Africa (Akan and Ashante folklore), he made his way over to the Caribbean and the Americas. According to legend, owns all the stories in the world. Constantly hungry, not above stealing and cheating, endowed with serious balls. The latter is not a metaphor. Married to Aso, who is pretty much the only person who can out-smart him. Find stories here. Also, check out Neil Gaiman's The Anansi Boys. Better known in English as the Monkey King; the undisputed main hero of the Chinese epic Journey to the West. Immortal, invulnerable, invincible, still a monkey. Crossed his name out of the Book of Death, stole the Peaches of Immortality from Heaven, scared the stuffing out of the Dragon Kings. Deity of Blunt Force Trauma. Turned Buddhist. Stars in Chinese, Japanese and Western movies and TV shows. All. The freaking. Time. Also known as Sang Kancil, the resident Trickster of Indonesia. Tiny, smart, thinks fast on his scrawny little feet. Strong contestant for the title of "weirdest creature" in Tricksterdom. But do not be fooled: Mouse Deer, in my experience, is the uncontested favorite of many audiences (including, surprisingly, teenagers). Seriously, I'm not going to introduce Loki. Duh. Move along. One of the greatest Tricksters in the Western hemisphere, Coyote pops up in several American Indian cultures. Unkillable, wily, foolish; known for stealing the fire, among many other things. The original inventor of "dancing with the stars." Find a lovely collection of Coyote tales here. Also, you want to read Christopher Moore's Coyote Blue. Remember the little guy from Midsummer Night's Dream? Yep, that's a Trickster. Also known as Robin Goodfellow. Half human, half fae. Completely out of control. The one and only. Hero of hundreds of Appalachian Jack tales, killer of giants, navigator of flying ships, climber of beanstalks, challenger of Death, ravager of other people's property. Young, cheeky, with serious attitude. Believe me, I can go on about Tricksters until someone duct tapes my mouth shut. Raven. Iktomi. Nanabush. Kitsune. Tanuki. Reynard the Fox. Ti Malice. Nasreddin Hodja. Every culture has one. Some of them have more. But if I listed all of them, where would be the fun of discovery? Go forth, and find your Trickster. or you can buy her book, Tales of Superhuman Powers, which incidentally also features tricksters. Go figure. Hello everyone. My name is Tim Brannan. I blog over at The Other Side where I primarily talk about games, RPGs and horror. I am a game author so I use my blog as a platform to talk about my books, but also to share with others in my blogging community to sorts of things I like to write about. I have been writing material for games nearly as long as I have been playing them. I started in 1979 and my first "custom class" was a Healer. And....I am not afraid to admit my first new monster I ever wrote up was a "Smurf". Yeah. I was 10. My first witch class was written sometime between 1985 and 1986. This was my fourth year of doing the A to Z Challenge on the Other Side. I have also done it one year on my Atheism blog, The Freedom of Nonbelief and another year at Red Sonja She-devil with a Sword, a shared blog dedicated to the comic book character Red Sonja. 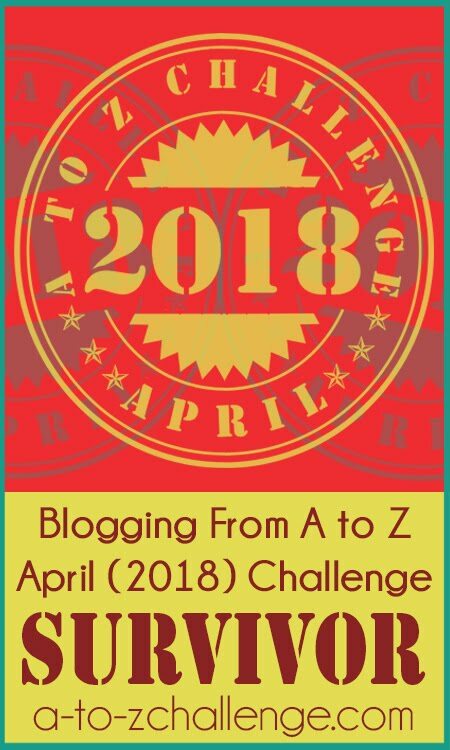 Plus I have guest-posted here before on how to use the A to Z challenge in your own writing efforts and the importance of having a theme to your posts. One would have thought I would have been more prepared this year! At some point in February I was still planning on doing an A to Z theme on Vampires. I had started the posts last year when I did Demons. I had an idea for a book about vampires and I thought it would have been a good way to do some research. It was. Till I shifted midstream. My newest book is now at Kickstarter to get funding for art and printing. 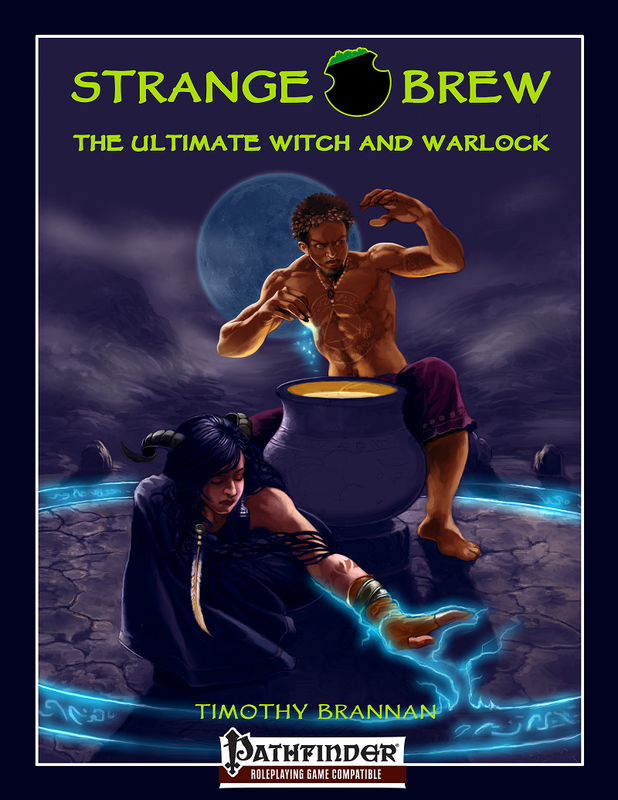 "Strange Brew: The Ultimate Witch & Warlock" is, well, the most complete guide to playing a witch in the Pathfinder game. A bit of background. Back in 2000 the 3rd edition of Dungeons & Dragons hit the shelves with the "Open Gaming Licence" which briefly meant 3rd party authors could make their own books for D&D and not get sued or anything like that. If you followed the admittedly simple rules of the Open Game Licence then you could do it. Well I did and in 2003 I released "Liber Mysterium: The Book of Witches & Warlocks". A friend of mine released a similar book for witches called "Way of the Witch". We liked each other books and we were happy. 2013 rolls around and this friend, Christina, decides it is time we mixed our books together with the newest version of the D&D 3rd edition game, Pathfinder (it's not exactly, but close enough). We added in the Pathfinder witch and some others and decided to kick start it as a project. So far things are going great! But my extra writing time was taking a solid hit. I have 13 years worth and thousands of pages of notes and material to go through. So to save some time I switched over to the A to Z of Witches. It was a good idea. Go through notes, post ideas as they come to me. I only managed to stay about 10 days ahead of schedule and that was nowhere near enough. So much for my own advice about theme and planning! I got a lot of great posts up and in fact have enough for another couple months of solid witch postings. I got to participate in a "mini-hop" of people doing supernatural creatures during the A to Z as well and that was the best! I have to give very special thanks to Tasha (Tasha's Thinkings) and Sophie (Sophie's Thoughts and Fumbles) for helping me with the idea and then doing all the heavy lifting afterwards. THEY, and everyone in the Supernatural mini-hop, really made this A to Z special for me. 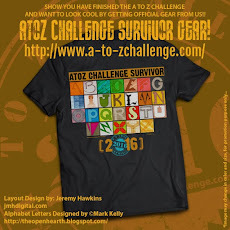 If you look at my May 5th post I state I survived the A to Z challenge. Survived is the right word. Not beat, not won, but survived. Yes I posted everyday and still got in some of my other posts. Yes I visited my neighbor blogs, but didn't always comment on them. Yes the material I wrote will find a home somewhere in Strange Brew. But, I didn't get to interact with other bloggers as much as I wanted. I didn't visit every blog on the list like I have in years past. And while I noticed that I was getting a good amount of traffic from the Supernatural A to Z and from the A to Z site itself, my regular readers dropped off. So in that respect I didn't do as well as I would have liked. I write about games. That is who I am and what my readers want. I tried to keep the topics I posted very relevant to gamers, but also to the non-gamers. Most people in the world don't care if some beastie has 5 HD or 15 HD, you just want to know how tough it is. To gamers that is a big deal. It's a big deal to me. I love doing the A to Z and I am taking my own advice to heart and starting my 2015 posts this summer. I am still considering doing vampires. So to make it work there needs to be plenty of material for gamers (what we in the RPG biz call "crunch") and plenty of narrative material enjoyed by everyone else (what we call "fluff"). Start my post writing early. Crunch takes longer to write than Fluff. I'll need the time. Keep enough crunch to keep my regular readers happy. Especially if it something new. Keep the fluffy interesting to keep the A to Zers coming back. Visit and interact with more of the bloggers in the A to Z. If I write all my posts this should be easier. I would LOVE to participate in another mini-hop like I did this year. That was awesome. He has worked on a number of games including the "Buffy the Vampire Slayer RPG", and is the author of “The Ghosts of Albion RPG”, “The Witch”, “Eldritch Witchery” and the upcoming “Strange Brew” which is currently in a Kickstarter Campaign. Please stop by and see if this is something you would like to support. #atozchallenge #roadtrip - Stormy and Heather hit the road! So, welcome to our first leg of the Post A-to-Z Road Trip! We really can't start this trip without visiting the founder and leader of this great Blog Challenge, Arlee Bird aka Lee. His vision for the Challenge may have started small but it certainly has taken on a life of its own. 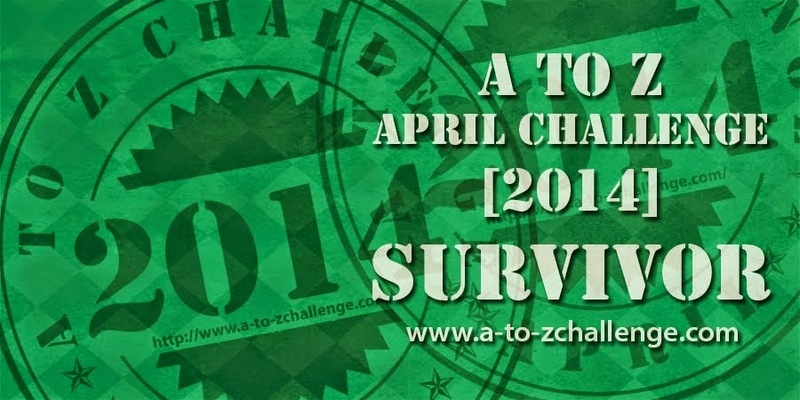 Over 2000 people participated in the April Challenge. Lee's theme, on 1 of his 4 blogs, was Marketing Concepts from A to Z. We can all learn a lot from Lee, so I highly recommend visiting his April posts. Tracey's A to Z theme was all about her favorite fictional characters. Buffy the Vampire Slayer, Marvel, Star Wars, Disney, Harry Potter, Supernatural & Star Trek just to name a few! Joss's A to Z theme was all dogs all day long! So many dogs so little time! Pictures and videos! DOGS! Tiffany's A to Z theme was books, books, and more books! Book reviews, TBR lists, recommendations! Lots and lots and lots of books are listed in this blog. Melanie's A to Z theme was a Haiku for every day in April! Also, look for her links to her stories from the 2012 and 2013 Challenges.